A rift between Texas “pro-life” groups over how to regulate end-of-life care from the 2013 legislative session is continuing into the 2014 election cycle. A rift between Texas “pro-life” groups from the 2013 legislative session on how to regulate end-of-life care is continuing into the 2014 election cycle. One group’s political scorecard has created a minefield in some Republican primary races, leading to heavy criticism from Roman Catholic bishops in Texas. Texas Right to Life’s 2013 scorecard, which grades lawmakers based on their support and opposition to legislation related to anti-abortion and end-of-life issues, holds great sway in many Republican primaries. But the Texas Catholic Conference, which lobbies on behalf of the 15 Roman Catholic bishops of Texas and their dioceses, says the group has, in order to exert political power, misrepresented politicians committed to both anti-abortion causes and the rights of the terminally ill. The source of its criticism is the scorecard’s penalties for lawmakers regarding legislation that would have amended the state’s Advance Directives Act. “What was most troubling to the Texas Catholic Bishops was that the scorecard appears to attack those legislators who supported perhaps one of the most pro-life bills during the 83rd session,” Jeffrey Patterson, executive director of the Texas Catholic Conference, wrote in a letter to legislators. Texas doctors are allowed to discontinue medical treatment they deem medically futile. While patients or their surrogates can appeal a doctor’s decision to a hospital ethics committee, advocacy groups that identify as “pro-life” say state law does not go far enough to protect patients’ rights. In the 2013 legislative session, Senate Bill 303, which had the support of the Catholic groups as well as Texas Alliance for Life, and multiple medical associations, would have prohibited doctors from issuing “do not resuscitate” orders without notifying the patient or the patient’s surrogate, extended the timeframe to find an alternative provider to 14 from 10 days, and ensured the patient or patient’s surrogate received assistance navigating the appeals process. Meanwhile, Texas Right to Life endorsed Senate Bill 675 which would have abolished hospital ethics committees and required doctors to continue treatment until the patient or the patient’s surrogate found an alternative provider. Neither measure succeeded. Patterson said Texas Right to Life selectively counted votes and haphazardly assigned points to attack lawmakers who supported SB 303 instead of the bill it backed. As a result, he said, the scorecard misleads voters and unfairly characterizes lawmakers who have spent their careers supporting “pro-life” issues. Graham said that the group’s scorecard was “calculated on our legislative priorities, which we communicate to members before and during the session.” She said the group travels the state seeking input from lawmakers and stakeholders to build their agenda before the session and reminds lawmakers multiple times how they will be scored. Texas Right to Life attributed a third of its scorecard to the end-of-life issue: Lawmakers who supported SB 303 or its House companion, House Bill 1444 received 56 out of 100 points on average. Texas Right to Life deemed 12 Republican members of the Senate and 17 Republican House members “disappointments” — even though they backed strict new abortion regulations — because they supported SB 303 or HB 1444. Nine of the Republican House members who supported the bill received perfect scores from Texas Right to Life in 2011, but this year, none of those scored more than 59 points. 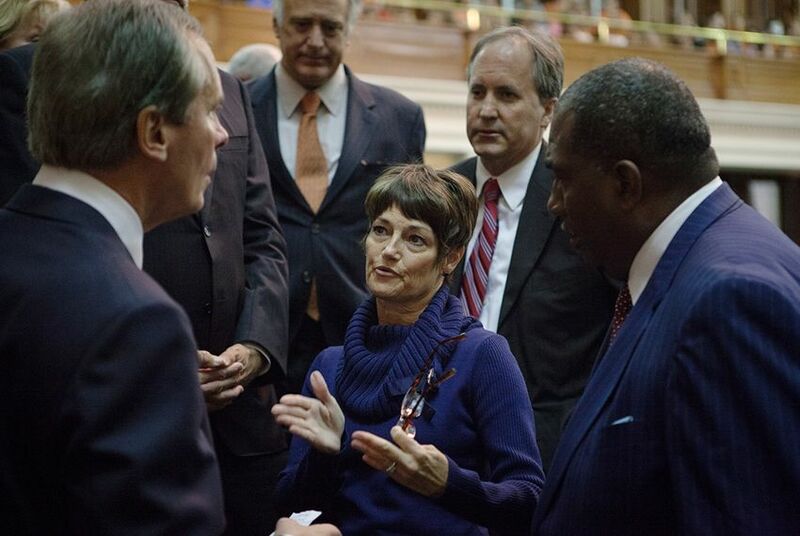 Although SB 303 passed the Senate, it stalled after Texas Right to Life told House lawmakers that the group’s scorecard would castigate anyone who supported the bill. State Rep. Bryan Hughes, R-Mineola, who received Texas Right to Life’s third-highest 2013 rating, said some may consider that a threat, but he appreciates the group’s frankness about its agenda. But Patterson said Texas Right to Life’s misrepresentation of SB 303 — such as false accusations that the bill promotes “death panels” — increases cynicism of the political process and misleads voters. He pointed out that even politicians who played key roles in the passage of the anti-abortion regulations have received disparaging criticisms of their “pro-life” record by Texas Right to Life. Texas Right to Life’s endorsement of Campbell in 2012 helped the freshman legislator oust a Republican incumbent who’d held the seat for nearly two decades. This time around, Campbell is facing three primary opponents and heavy criticism from Tea Party conservatives for her position on SB 303. In an email to The Texas Tribune, Campbell said how scorecards “reflect the truth is always open to interpretation,” and lawmakers made great strides for “pro-life” issues this session. “That's not open to interpretation, and I am grateful to every legislator who stood on the side of life,” she said. The author of SB 303, state Sen. Robert Deuell, R-Greenville, received 53 points from Texas Right to Life, even though he was also the original author of Texas’ law that requires abortion facilities to meet the same standards as ambulatory surgical centers in 2014. “I had a more-than-perfect pro-life record up to this time, and my colleagues who voted for it did the right thing,” Deuell said.